The film “The Woman in the Mirror” was screened at the NTT CRED Hall 1 on 21st Nov. This 129 minute film portrays the agony of the woman who was exposed to radiation in Hiroshima during A-bomb and her journey of searching for her daughter with a suspenseful touch. The talk show was held after the screening. The audience gave a big applause to the appearance of the veteran film director, Mr. Yoshishige Yoshida, his wife and the celebrated actress, Ms. Mariko Okada. 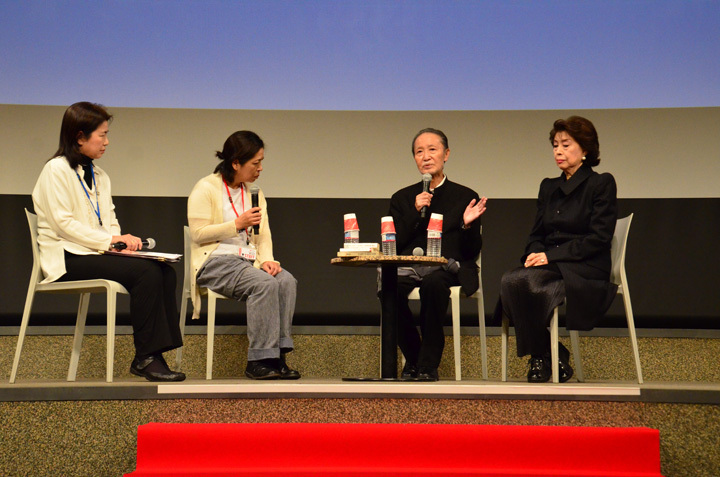 The facilitator in the event was Ms.Yukiko Suzuki, the film commentator. “The Woman in the Mirror (2003)” was made for the first time in 14 years by Mr.Yoshida who has been shooting hit movies since 60’s. This film was specially screened as official invited work at the 55th Cannes Film Festival. Also, this work is Ms.Okada’s 154th film and the 50th anniversary of her acting career. Mr.and Ms. Yoshida are deeply attached to this movie. Ai Kawase(Ms. Mariko Okada) has been searching for her missing daughter, Miwa for 24years. Miwa had disappeared after her daughter Natsuki (Ms. Sae Isshiki) was born. One day, Ai gets a call from city hall that they had found the woman belonging to Miwa’s maternity record book. This woman is called Masako Ogami (Ms.Yoshiko Tanaka) who has lost her memory. Ai calls her granddaughter Natsuki to come back to Japan from America to identify this woman as her real daughter. By contacting with Ai and Natsuski, Masako’s memory gradually comes clear, and they try to head to Hiroshima where Ai and Miwa were born.…. 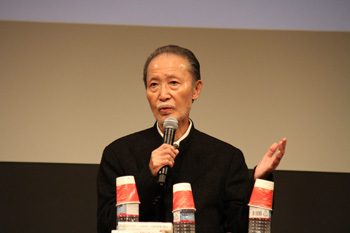 At the talk show after screening, Mr. Yoshida spoke about his war time experience in his hometown Fukui and explained how he struggled to depict A-bomb in the movie while realizing that it can not be expressed by human. She also commented on such a long 7 years production period including to making plot. “I had been watching my husband struggling to complete the script in his study room. When he finalized the script, he handed me it as a gift for my 50th cerebration in my actress life. I was deeply touched with it. I read his marvelous script with tears in my eyes. “My husband has made me what I am as an actress today, thanks to him. This is kind of my boast ” She expressed her thankfulness to her husband as well as film director. 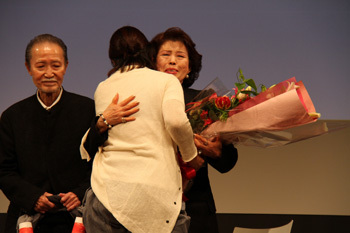 The production designer was Ms.Yoko Heya, President of HIFF. Lastly, Mr.Yoshida enthusiastically commented on 70 years after A-bomb, “Japan has amazingly restored from the devastation of A-bomb. I strongly believe the vitality of people.